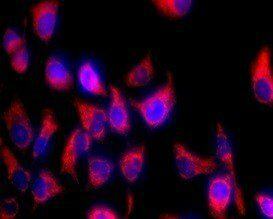 Abbkine Mitochondrion Staining Kits are a set of fluorescence imaging tools to label mitochondria of live cells. 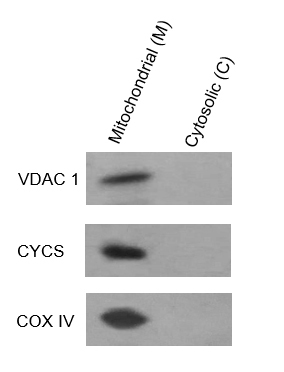 This kit uses a proprietary mitochondrial green fluorescent probe (Ex/Em=490/523 nm), which, unlike other probes, appears to localize to mitochondria, much less depending on mitochondrial membrane potential. The dye, a hydrophobic compound, has the added advantage that it is essentially nonfluorescent in aqueous solutions and only becomes fluorescent once it accumulates in the lipid environment of mitochondria, and can stain live cells and formaldehyde-fixed cells, but after permeabilized, the fluorescent signal will be lost. 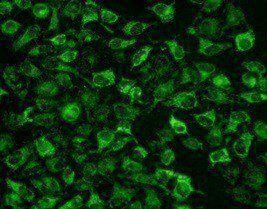 The fluorescence can be measured using fluorescence imaging, high-content imaging, microplate fluorometry, or flow cytometry. This kit is suitable for proliferating and non-proliferating cells, and can be used for both suspension and adherent cells. Fig. Hela cells stained with TraKine™ Mitochondrion Staining Kit (Green Fluorescence). 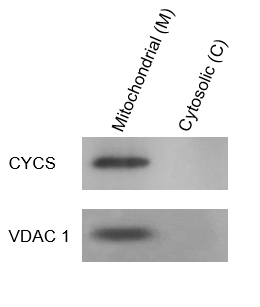 • Enables the uniform staining of mitochondrion across a wide variety of mammalian cell types, and can be used for both living and fixed suspended or attached cells. • Optimized for various fluorescence platforms such as microplate assays, flow cytometry and fluorescence microscope. • Proprietary MitoGreen™ (Ex/Em = 490/523 nm)-much less depending on mitochondrial membrane potential. Refer to list of materials supplied for storage conditions of individual components. Stable for at least 6 months at recommended temperature from date of shipment. Mitochondria is a double-membrane-bound organelle found in most eukaryotic cells. The function of mitochondria is to provide cellular energy. Moreover, mitochondria are involved in other tasks, such as signaling, cellular differentiation, and cell death, as well as maintaining control of the cell cycle and cell growth. Mitochondria have been implicated in several human diseases, including mitochondrial disorders, cardiacdysfunction, heart failure and autism. Mitochondria may play an important role in these cellular processes.